With 12 years of experience, M. Dang currently is the portfolio manager responsible for the absolute return portfolio at CN Investment Division. 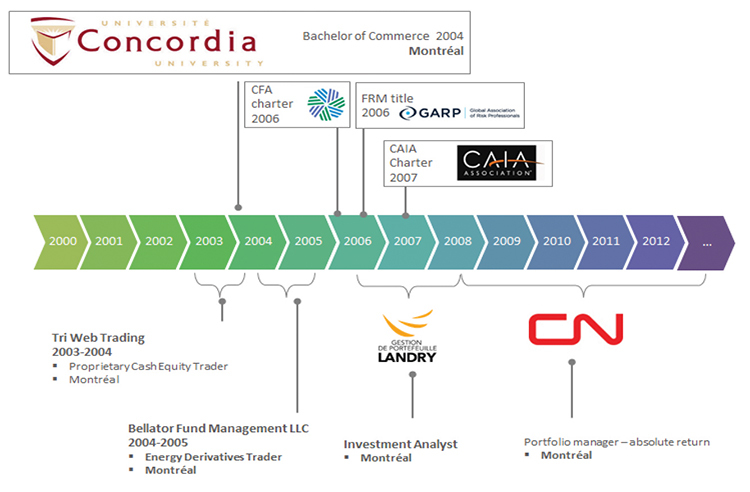 Before arriving at CN, Nicolas was an investment analyst at Landry Morin for a little under 3 years. He was also an energy derivatives trader at Bellator Fund Management LLC and a proprietary cash equities trader at Swift Trade. In addition to his professional experience Nicolas is also Co-Founder and Intellectual Philanthropist at Junto Montreal Society for Useful Knowledge. 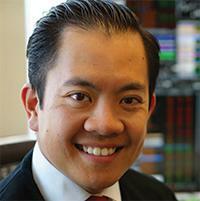 Nicolas has a Bachelor of commerce from Concordia University, as well as the CFA and CAIA charters, and the FRM title. When did you start your career and what was your first job? Was it a job that you had targeted? One year before graduating from my bachelor’s degree I decided I wanted to get real world experience from an unconventional firm. So my last year of university I took night classes and worked full time as a day trader. I worked for a firm that gave capital to non-experienced traders, which they trained. We then invested their money. To me it was important to differentiate myself from my peers at graduation time and was the main reason why I decided to work full time. Part of the job used a topic which I really enjoyed studying: behavioral finance. Back when I was in university this topic was not as popular as it is today. I quickly realized that I needed more formal training to become a more well-rounded investment professional and to be able to compete with highly sophisticated traders and so I enrolled in the CFA program. The CFA helped establish a certain level of credibility at an early stage of my career. Did you respect your career plan? How many times have you changed employers or positions with the same employer? What was the primary reason for the change? I believe there are two types of career paths, a traditional career path and a flexible one. I choose the flexible option as it better suited my personality. For me, the most efficient environment to learn in was found working in smaller boutique firms. I worked for many smaller firms and I was lucky enough to find them in Montreal. I started out doing proprietary trading, and then worked at a hedge fund as a derivatives trader, followed by being a quantitative analyst. I then started my own firm and in 2008 I began working at CN Investment division. My plan from the beginning was to become a portfolio manager but I knew if I adopted a more traditional path it would be much more difficult as it is a very narrow path. So I made sure that wherever I was working I was able to acquire transferable knowledge so that I could open more doors in the future. Describe your current job. What do you like most about your current role? Were there any major obstacles that you had to overcome in order to follow your career path? My current role as portfolio manager – absolute return covers mainly hedge funds. I am in charge of the hedge fund portion for CN nvestment Division. My job is to pick hedge fund managers to make sure I meet the program’s risk/return target. I find it to have been a privilege to have worked as a trader in capital markets as it enables me to better understand certain aspects of my current role. Hedge funds are sophisticated investment strategies that require additional governance and a strong due diligence framework.. This adds an extra layer of complexity versus traditional investments but it’s this challenge that I really enjoy. Hedge funds are a tool we use to produce additional returns all while aiming to lower the overall portfolio risk. In terms of obstacles, complexity can be seen as a curse but if you look at it in terms of an opportunity it can add significant value to an asset mix, which is a blessing. In order to be successful in a complex environment, you need to have effective communication skills, especially as a portfolio manager. You need to communicate complex ideas so you can sell them to certain colleagues who aren’t always accustomed to them. Lastly, meeting with the best hedge fund managers from across the globe is something I really enjoy. I relish in the opportunity to continuously learn about the tactical and strategic decisions required in running their business. What do you consider to be the most important competencies in order to be successful in your area of expertise? What role has the CFA charter had in your career development? Networking skills are a must. I had to develop mine and I believe all should put in some level of effort into theirs. I viewed integrity as the most important currency that one can use in order to be able to leverage his or her network. The CFA charter really focuses on integrity and that in turn gives you a standard by which you can exchange ideas with others, whether it is with portfolio managers, peers or colleagues at work. The objective is to learn from others. If we want to think out of the box we need to exchange ideas with others in order to increase our knowledge base and be more imaginative. The CFA charter was a way for me to make sure I knew as much as the others investment professionals did. Back then the charter was considered a nice to have, but in today’s environment it’s a must have. To me the charter demonstrates that an individual has a strong foundation in terms of ethics and investment knowledge. I also pursued two others designations, FRM and CAIA to complement the CFA. How do you perceive the career opportunities in your sector? What advice would you give to a person who’s beginning a career in this sector? The prospects of a certain field are an important factor to consider, but I don’t believe anyone should go into a field just because the prospects are good. I believe in focusing on your interests first. Broadly speaking, as more and more baby boomers retire the younger generation is becoming more influential. Consequently there should be more openings in the future. In my opinion the buy side seem to have good prospects for growth. While tail wind may great help with sailing, one ought to make sure to be equipped to navigate the rough waters, thus investment in knowledge helps. The best advice I can give is to really focus on your networking skills and put them to work. Look at where you are today, look at where you want to go and look at the tools and experience that you are lacking in order to get there. Meet with people that are in a position that you want to be in 5 to 10 years and find out how they got there. Ask them what you should focus on and what should you avoid. I see LinkedIn as a great tool to facilitate networking.